If it’s a modern, inner-city, slick venue with a view you’re looking for, then the Hilton Wembley might well be the place for you. 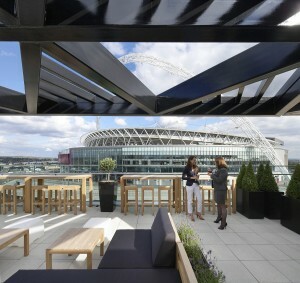 The roof terrace here has far-reaching sightlines over Wembley Stadium, the London skyline and the surrounding area. Truly sophisticated and also easily customised, the terrace has a stone tiled floor, plenty of seating, a modern take on a veranda for shade, and glass barriers to make the most of the view. As you can imagine from a commercial hotel chain, drinks and catering are well taken care of and menus come in a range of budgets – and this space is only available to hire exclusively for receptions, so privacy is guaranteed. Just a short journey out of the hustle and bustle of London, The Bingham Hotel resides in one of South-East England’s prettiest spots. The accomplished and reputable on-site restaurant has a charming outdoor area available for private hire, which overlooks the manicured gardens that roll down to the Thames. The food served here is familiar yet elegant, with canapé menus offering treats such as mini steak pies, smoked salmon crackers and finger-sized cheesecakes. Particularly suited to summer wedding receptions and able to offer al fresco sit-down dining, this venue also offers a range of function rooms, 15 bedrooms and a family-friendly atmosphere. The Academy is a rare find in Central London. 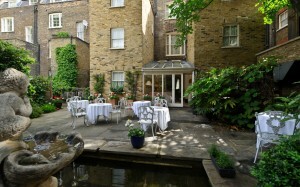 This stylish boutique hotel has been formed out of old Georgian townhouses, and offers an enchanting outdoor space. 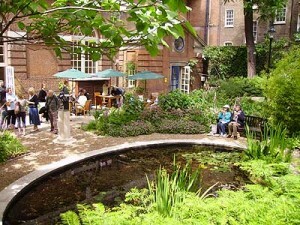 A large patio area is enclosed at the far end by tall trees, thick shrubs and unusual flowers, with small water features hidden in corners and an air of traditional charm. Simple yet understated and perfectly executed, this welcoming garden is tranquil and homely while still maintaining a sense of occasion. Again, a range of function rooms is available as additional indoor space, but for a city centre summer party, The Academy offers fantastic value for money and a lovely retreat from the buzz of the metropolis. 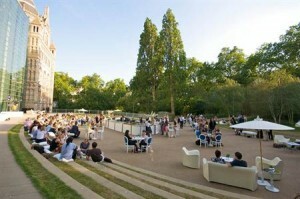 The Natural History Museum has given Function Fixers the chance to book the ultimate summer party within its walls. Up to 350 people can be accommodated for a truly unusual and wonderful evening here, and you will have the opportunity to treat your guests to an really unique experience. The Museum’s summer exhibition celebrates nature, and you can host your party in the exhibition room itself. ‘Room’ is a loose term – rather, you will enjoy a fabulous dinner underneath an 8 story high atrium, which has had an astonishingly large and detailed cocoon built within it. You’ll have the opportunity to provide your guests with a tour guide for a little education after supper, or you could simply enjoy wondering freely around the exhibition. What makes the venue relevant to summer parties, however, is the capacious contemporary garden – which can be hired privately after public opening hours. Your guests can explore as they please, or you can use different areas for different stages of your party – but however you choose to plan your event, one thing is certain – your guests will never forget it! BMA House offers a versatile range of function rooms that lead directly out onto a mature and secluded botanical courtyard garden. This includes a stunning Garden Room – a contemporary space with white walls, a wooden floor, beautiful arched windows and a 24ft high ceiling. A small flight of steps leads to the Garden, where you’ll find large round pond featuring a fountain and lily flowers, and a patio looking over long-established shrubs and blooms. 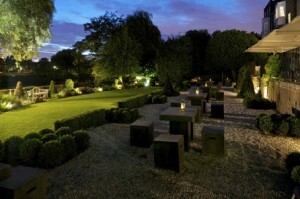 With space for up to 90 people, this is a spacious and charming venue for a summer party. A range of menus can be created at your request, and price is entirely reliant on your choice of foods. Buffets at BMA House are inexpensive yet still sure to impress, but splashing out a little more on the delicious hand-crafted canapés available will really have your guests talking. Call Function Fixers to learn more about our summer party venues!